Calderdale Council are considering divesting their pension fund after Kirklees Council made a similar move. Calderdale say they are considering future-proofing the fund by moving their money away from fossil fuels to more sustainable investments. 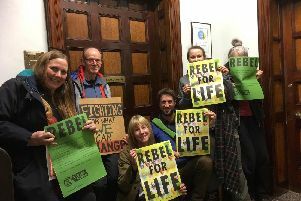 The comments came at the Cabinet meeting on Monday, when a question was raised by Calderdale Friends of the Earth. Anthony Rae, coordinator of Calderdale FoE, said: “Friends of the Earth nationally are urging councils to divest from fossil fuels. “First of all because fossil fuels are contributing to the climate change problem. We’re investing in something which is very destructive. The West Yorkshire Combined Authorities currently have £671 million invested in fossil fuels. This makes up roughly 6.5% of the total pension fund, which is the third largest amount of any UK local authority. Councillor Bob Metcalfe, who sits on the Investment Panel, said at the Cabinet bmeeting: “The pension panel has already been looking into investment in alternative energy. Kirklees Council passed a motion last week to divest their pension fund after the issue was raised by Kirklees FoE. Mr Rae says he hopes that if Calderdale follow suit, this will prompt other councils in the West Yorkshire Combined Authority to consider the move as well.